NOTICES FILINGS TODAY FOR APRIL CONTRACT MONTH: 0 NOTICE(S) FOR nil OZ. The bankers started their whacking so our underwriting banks steal from the public at large. In silver, the total open interest SURPRISINGLY FELL by 204 contracts from 188,831 down to 188,627 with THE FLAT PRICE THAT SILVER UNDERTOOK WITH YESTERDAY’S TRADING (DOWN 0 CENTS) . THE LOSS IN OI ALSO CONTRASTS COMPLETELY TO THE LOSS IN GOLD OI DESPITE GOLD’S RISE IN PRICE YESTERDAY. WE MAY BE EXPERIENCING BANKER CAPITULATION IN BOTH GOLD AND SILVER NOW. IN SILVER AGAIN, THE BANKERS ARE LOATHE TO SUPPLY NEW PAPER. NEWBIE LONGS JUST TRADED CONTRACTS WITH OLDER SPECS. RESULT: A SLIGHTLY LOWER OI WITH NO GAIN IN PRICE. In ounces, the OI is still represented by just UNDER 1 BILLION oz i.e. 0.944 BILLION TO BE EXACT or 135% of annual global silver production (ex Russia & ex China). In gold, the open interest FELL BY ONLY 826 CONTRACTS DESPITE THE RISE in price of gold ($5.05 GAIN ON MONDAY .). The new OI for the gold complex rests at 505,829. THE LOSS IN OPEN INTEREST DESPITE THE GAIN IN PRICE MAY MEAN THAT THE BANKERS ARE NOW BEGINNING TO FEEL PAIN IN GOLD. WE WILL HAVE TO SEE MORE DAYS LIKE THIS TO SEE IF A PATTERN DEVELOPS. THE BANKERS DID NOT SUPPLY MUCH OF THE SHORT PAPER AND NEWBIE LONGS DROVE UP THE PRICE WITH SELLING COMING FROM OLDER LONGS. TODAY, THE BANKERS ORCHESTRATED A RAID ON GOLD AND SILVER HOPING TO SEE BOTH GOLD AND SILVER LEAVES FALL FROM THEIR RESPECTIVE TREES. Result: A LOSS IN OI with GOOD GAIN IN PRICE IN GOLD. we had: 0 notice(s) filed upon for nil oz of gold. IN THE LAST 27 TRADING DAYS: GLD SHEDS 37.68 TONNES YET GOLD IS HIGHER BY $53.15 . 1. Today, we had the open interest in silver FALL BY 204 contracts from 188,831 DOWN TO 188,627 (AND now A LITTLE FURTHER FROM THE NEW COMEX RECORD SET ON FRIDAY/APRIL 21/2017 AT 234,787) DESPITE THE FLAT SILVER PRICE SILVER. AGAIN WE WITNESS THE BANKERS REFUSE TO SUPPLY THE SHORT PAPER. NEWBIE LONGS TRADED CONTRACTS WITH OLDER SPECS. RESULT: LOWER OI WITH A FLAT PRICE. Although China is reining in its shadow banking sector, the other side of total financing debt continues to explode. To the surprise of many, Chinese banks have already reached 80% of total loan quota given at the start of the year. We are already seeing evidence of a slowdown in loan creation in July. Treasury slaps sanctions on both Chinese and Russian entities who are helping North Korea with their nuclear ambitions. This should anger both China and Russia and of course North Korea. UK’s version of subprime, Provident crashes most on record as its CEO (aptly named peter Crook) quits amidst probes on its financing. as missing . The Awans, it is alleged, sold the equipment. Remember that they also represent 40 members of the house, and that is no doubt , how they accumulated over 4 million dollars in funds. iv)This is going to be very interesting: a Federal Judge orders the IRS to release names of specific IRS employees who were told to target various Tea Party Conservative groups. The actions of the IRS in targeting Tea Party members are criminal in nature. The judge ordered the iRS that they have to reasons for the targets…. The total gold comex open interest FELL BY A TINY 826 CONTRACTS DOWN to an OI level of 505,829 DESPITE THE RISE IN THE PRICE OF GOLD ($5.05 with YESTERDAY’S trading).This time for once, the bankers did not supply the necessary gold short paper. Newbie longs bid up the price of gold with the supply coming from older spec longs who decided to exit at a profit. We are now in the contract month of August and it is the 3rd best of the delivery months after December and June. The active August contract LOST 14 contract(s) to stand at 832 contracts. We had 0 notices filed on YESTERDAY so we LOST 14 contracts or an additional 1400 oz will NOT stand at the comex and 14 EFP’s were issued which entitles the long holder to a fiat bonus plus a futures contract and most probably that would be a London based forward. The non active September contract month saw it’s OI GAIN 33 contracts UP to 1364. The next active contract month is Oct and here we saw a GAIN of 66 contracts UP to 52,199. The very big active December contract month saw it’s OI LOSE 1824 contracts DOWN to 395,481. LAST YEAR WE HAD A MONSTROUS 44.7 TONNES OF GOLD INITIALLY. BY THE CONCLUSION OF THE AUGUST CONTRACT MONTH 44.358 TONNES STOOD FOR DELIVERY. And now for the wild silver comex results. Total silver OI FELL BY A SLENDER 204 CONTRACTS FROM 188,831 TO 188,627 DESPITE YESTERDAY’S NO GAIN IN PRICE. THERE IS NO QUESTION THAT WE ARE HAVING CONTINUAL BANKER CAPITULATION AS THEIR HUGE SHORTS IN SILVER ARE CHOKING THEM TO DEATH. THE BANKERS ARE REFUSING TO SUPPLY NEW SHORTS. NEWBIE LONGS TRADED CONTRACTS WITH OLD LONGS . RESULT: SLIGHT LOSS IN OI AND A NO GAIN IN PRICE. We are now in the next big non active silver contract month of August and here the OI FELL 10 contracts DOWN TO 23. We had 24 notice(s) filed yesterday. Thus we GAINED ANOTHER 14 contract(s) or an additional 70,000 oz will stand for delivery in this non active month of August and AGAIN zero EFP’s were issued for the August contract month. Please note that in gold we continually see EFP’s issued but not in silver!! The next active contract month is September (and the last active month until December) saw it’s OI fall by 9431 contacts down to 80,314. The next non active contract month for silver after September is October and here the OI gained 27 contacts up TO 478. After October, the big active contract month is December and here the OI GAINED by 8571 contracts UP to 95,146 contracts. Today, 0 notice(s) were issued from JPMorgan dealer account and 0 notices were issued from their client or customer account. The total of all issuance by all participants equates to 0 contract(s) of which 0 notices were stopped (received) by j.P. Morgan dealer and 0 notice(s) was (were) stopped/ Received) by j.P.Morgan customer account. To calculate the initial total number of gold ounces standing for the AUGUST. contract month, we take the total number of notices filed so far for the month (4581) x 100 oz or 458,100 oz, to which we add the difference between the open interest for the front month of AUGUST (832 contracts) minus the number of notices served upon today (0) x 100 oz per contract equals 541,300 oz, the number of ounces standing in this active month of AUGUST. Over a year ago the comex had 303 tonnes of total gold. Today the total inventory rests at 269.91 tonnes for a loss of 32 tonnes over that period. Since August 8/2016 we have lost 83 tonnes leaving the comex. However I am including kilobar transactions and they are very suspect at best. IN THE LAST 12 MONTHS 83 NET TONNES HAS LEFT THE COMEX. Thus the INITIAL standings for silver for the AUGUST contract month: 1089 (notices served so far)x 5000 oz + OI for front month of AUGUST(23 ) -number of notices served upon today (14)x 5000 oz equals 5,515,000 oz of silver standing for the AUGUST contract month. This is extremely high for a non active delivery month. Silver is being constantly demanded at the silver comex and we witness again the amount of silver increases daily right from the get go. We GAINED ANOTHER 14 contracts or an additional 70,000 oz wishes to stand for delivery in this non active month of August and 0 EFP’s were issued for the silver August month. At this point in the delivery cycle last year on August 22/2016 we had 82,277 contracts standing vs this yr at 80,590. Last yr on the first day notice for the Sept silver contract we had 17.070 million oz stand for delivery. FRIDAY’S CONFIRMED VOLUME OF 114,885 CONTRACTS WHICH EQUATES TO 575 MILLION OZ OF SILVER OR 82% OF ANNUAL GLOBAL PRODUCTION OF SILVER EX CHINA EX RUSSIA). IN OUR HEARINGS THE COMMISSIONERS STRESSED THAT THE OPEN INTEREST SHOULD BE AROUND 3% OF THE MARKET. 1. Central Fund of Canada: traded at Negative 6.8 percent to NAV usa funds and Negative 6.7% to NAV for Cdn funds!!!! Note: Sprott silver trust back into NEGATIVE territory at -0.57%/Sprott physical gold trust is back into NEGATIVE/ territory at -0.60%/Central fund of Canada’s is still in jail but being rescued by Sprott. August 17/late last night, a deposit of 4.43 tonnes of gold at the GLD/inventory rests at 795.44 tonnes/the bleeding of gold has stopped. AUGUST 4/ANOTHER LOSS OF 4.48 TONNES OF GOLD FROM GLD INVENTORY/INVENTORY RESTS AT 787.14 TONNES.THIS IS A HUGE CRIME SCENE!! *LAST 156 TRADING DAYS: A NET 6.84 TONNES HAVE NOW BEEN ADDED INTO GLD INVENTORY. *FROM FEB 1/2017: A NET 9.97 TONNES HAVE BEEN WITHDRAWN. August 22/no change in silver inventory at the SLV/inventory rests at 334.407 million oz. August 15/no change in silver inventory at the SLV/Inventory rests at 335.825 million oz. July 27/NO CHANGE IN SILVER INVENTORY/INVENTORY RESTS AT 343.812 MILLION OZ WITH SILVER UP 13 CENTS TODAY. July 25/A MASSIVE 3.309 MILLION OZ OF INVENTORY WITHDRAWN FROM THE SLV DESPITE SILVER’S 10 CENT RISE TODAY. July 18/a huge 946,000 oz withdrawal from the SLV despite silver’s 16 cent gain! US Treasury Secretary ‘assumes’ the gold is still in Fort Knox, 64 years after it was audited. 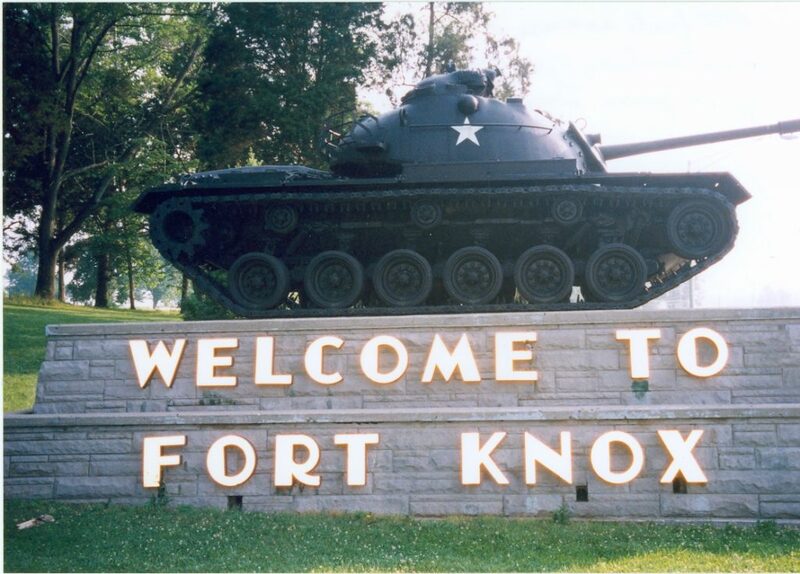 81 years after it was built Fort Knox received its third visit from a US Treasury Secretary yesterday, Steven Mnuchin. The fortified facility is reportedly surrounded by 30,000 soldiers, tanks, armored personnel carriers, attack helicopters, and artillery. Despite this, there is still concern as to whether the gold is there. With a background in Hollywood it was unsurprising that Mnuchin’s imagination appeared to be getting carried away with tales of finding the $200 billion of gold missing. Missing gold: fact or fiction? An empty Fort Knox is an issue far removed from the hills of Hollywood and has far more basis in reality than many give it credit for. For many decades campaigns have been led for the US Treasury and government to audit the gold and to testify to its existence. The gold has not been ‘counted’ since 1953. This was less than 20 years after Fort Knox was built. Since then there has been no official count or audit. The facility (purportedly) holds 147 million ounces of gold, worth around $186 billion. This is small compared to the amount purportedly held at the Liberty Street facility, in New York. 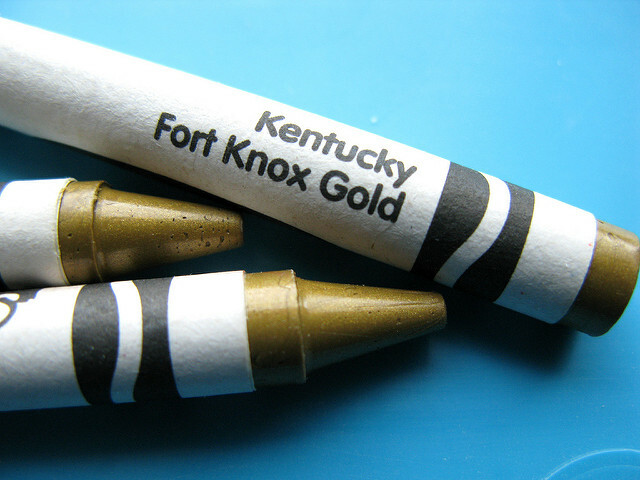 As with Fort Knox, the New York gold is yet to be audited. At the moment, a tweet from a US Treasury Secretary is all we have when it comes to assurance over the gold’s existence. Thanks to @usmint staff for hosting at #FortKnox#USBD. First @USTreasury Secretary to visit since John Snyder in 1948. Glad gold is safe! Congressman Ron Paul has argued previously that the US government ask Americans to trust that the Fort Knox gold is there plus gold stored elsewhere. They refuse to allow any checks and audits (whether independent or carried out by the government). Mnuchin is no doubt aware of the damage that would be done to the US economy should it come to light that the gold is no longer where it’s supposed to be. He has likely taken note of Goldfinger’s dastardly plan in the infamous Bond film. In Goldfinger the villain plans to contaminate the US gold holdings in order to boost the value of his and the Chinese’s own bullion. Whilst the gold in Fort Knox is unlikely to have been contaminated there is a strong argument that it isn’t there at all. Instead, it has been leased out many times over. As GATA found out between 2008 and 2009 the Fed keeps a secret of its gold-swap arrangements with foreign banks. Unsurprisingly gold-swap arrangements potentially lead to the eventual problem that no-one’s sure whose gold is whose anymore. It can be a high-end, expensive game of pass-the-parcel. It’s worth remembering that the gold held by the US Government is not just owned by America, they hold gold for many countries, including Germany. There is an argument to be made over whether or not Germany, or anyone else storing gold in a central bank abroad, owns allocated gold or is merely a ‘creditor’ on a metal statement, given gold swap arrangements. Concerns have been so great over the United State’s lack of interest in auditing the gold bullion that countries have begun to repatriate the gold and demand statements. Venezuela and Germany are the two most high profile countries to have recently repatriated their gold. Both went to big efforts to publicise the existence of the gold as it was repatriated. Germany even published bar numbers. The US has its own trust issues though when it comes to gold, thanks to the lack of checks in place. Two years ago the state of Texas were given the go ahead to build its own Bullion Depository, into which the state would repatriate over $1 billion worth of gold. The move by Texas highlighted mistrust in the Federal Government’s ability to not only keep the physical gold but also to not confiscate it should the monetary system run into problems. Gold going missing in the US is not a recent issue. Back in the 1920s Herr Hjalmar Schacht, then head of the German Central Bank, went to New York to see Germany’s gold. Despite the importance of the visit, Fed officials could not find the palette of Germany’s gold bullion. All of this serves as a timely reminder that we should learn from the mistakes of governments and central banks. Rather than offer up a blind trust to counterparties storing gold we should ensure that we have as much control as possible over our gold bullion. We believe that allocated and segregated gold bullion, stored in secure locations such as Singapore, Hong Kong and Zurich is the best way to store gold. When you do this with GoldCore you have control and a audit of your gold holdings so you know they are right where you want them, when you want them. 3b Japan 10 year bond yield: RISES TO +.042%/ GOVERNMENT INTERVENTION !!!! (Japan buying 100% of bond issuance)/Japanese yen vs usa cross now at 114.34/ THIS IS TROUBLESOME AS BANK OF JAPAN IS RUNNING OUT OF BONDS TO BUY./JAPAN 10 YR YIELD FINALLY IN THE POSITIVE/BANK OF JAPAN LOSING CONTROL OF THEIR YIELD CURVE AS THEY PURCHASE ALL BONDS TO GET TO ZERO RATE!! 3j Greek 10 year bond yield FALLS to : 5.587??? 30 SNB (Swiss National Bank) still intervening again in the markets driving down the SF. It is not working: USA/SF this morning 0.9662 as the Swiss Franc is still rising against most currencies. Euro vs SF is 1.1362 well above the floor set by the Swiss Finance Minister. Thomas Jordan, chief of the Swiss National Bank continues to purchase euros trying to lower value of the Swiss Franc. S&P futures are modestly in the green, following gains in European and Asian shares, after the cash index climbed on Monday for the first time in three days as volatility tumbled amid abysmal trading volumes. Meanwhile, European stocks joined an Asian stock rally following three days of losses, pushed higher again by mining shares as Antofagasta rose 5.5%, hitting a 4 year high on strong H1 earnings. Safe havens such as bonds, gold, and the yen declined despite the latest warning from Bridgewater’s Ray Dalio who said yesterday he was “reducing risk”, although not even he could offset the return of the VIX clubbing. Despite increasingly cautious rhetoric from iconic market investors, traders have again gotten over some of the sensitivity that characterized the past few days following political turmoil in Washington, fresh terrorist attacks in Europe and ongoing tension between the U.S. and North Korea. Nonetheless as discussed yesterday Dalio said he’s “tactically reducing” risk because he’s concerned about growing internal and external conflict “leading to impaired government efficiency” in the U.S., according to a LinkedIn post Monday. Back to Europe, where the Stoxx Europe 600 Index rebounded from the lowest in more than a week as miners and chemical makers led gains across almost every sector. Even with today’s rally, the Stoxx 50 is nearly 200 points below Wall Street’s year-end consensus target just above 3,600. The broad index of European stocks was up 0.4 percent on the day. The surge in European stocks pushed up the MSCI world equity index, which is now up 0.1 percent on the day, its second day of gains after sharp falls last week. The performance comes on the back of strong sentiment towards Europe that saw the euro record its biggest one-day gain in a month on Monday. Though the single currency dipped slightly on Tuesday, it is still around the $1.18 mark which analysts believe might prompt policymakers to consider action. Meanwhile over in Germany, we got another indication that Europe’s strongest economy has topped, after the 3rd ZEW decline in a row (August ZEW economic sentiment at 10.0, Exp. 15.0, Last 17.5) perhaps not surprising considering the poor DAX performance in recent weeks. The DAX pared gains to 0.5%, after earlier rising as much as 0.8%, after the Zew showed investor confidence fell more than expected. As a reminder, the DAX has dropped 1.6% so far this quarter, vs 0.2% dip for Euro Stoxx 50, 0.3% fall for CAC 40, and 5.7% rise for FTSE MIB. Is Germany getting sick again? In Asia, equity markets were mostly higher although news flow was remarkably light amid a lack of central bank speakers and macroeconomic data. Focus was on last night’s speech by US President Trump in which he highlighted US plans to continue sending troops to Afghanistan to fight the terror threat emanating from the country. Japan’s Topix index fluctuated before ending the local session less than 0.1 percent higher while the Nikkei 225 fell -0.05%, entering the longest losing streak since April 2016, while the ASX 200 was up 0.42% after numerous earnings, including from BHP Billiton. Korea’s Kospi index gained 0.4% while the Shanghai Composite rose 0.1%. Hong Kong’s Hang Seng Index rose 0.9 percent, outperforming other equity markets in Asia, on strong earning results. In macro, the DXY dollar index retraced yesterday’s entire push lower as EUR, GBP and AUD all continuously grind lower against USD amid little news. Dalian iron ore futures close above 600 yuan/ton for first time since March as rally in metals markets extends further. Italian BTPs sell off aggressively, with some noting summer related carry trades being unwound; UST curve bear flattens with focus on the strength in the USD, Bloomberg notes. The US dollar rose against most Group-of-10 peers amid profit-taking on short positions and as fresh long exposure was added before the Jackson Hole symposium later this week. The Bloomberg Dollar Spot Index rose by 0.3 percent in early trading, following a drop of 0.6% since Friday. Some investors trimmed their short exposure in the greenback after the gauge hit a three-week low on Monday, according to traders in Europe quoted by Bloomberg, looking to add again should the rebound in place start losing steam. Leveraged accounts were also seen adding fresh long positions as they see upside risks into Federal Reserve Chair Janet Yellen’s speech at Jackson Hole, Wyoming on Friday. Even as the dollar gauge looks to erase Monday’s losses, the medium-term outlook was little changed. The downtrend this year remains firmly in place, with August’s trading pattern resembling more of a consolidation phase than a significant rebound. Bloomberg’s fear and greed indicator suggests bulls are in control this month, yet the U.S. currency trades just 0.4 percent higher. In China, the offshore yuan closed at the highest since September 16, boosted by a stronger central bank reference rate after the dollar fell overnight. State media cited senior PBOC adviser as saying the Chinese currency’s advance may continue this year. In commodities, London copper echoed moves in China, and rose to a three-year high while zinc held close to its highest level in a decade while nickel logged a fresh annual peak. BHP Billiton, the world’s largest miner, reported a surge in underlying full-year profits and said it would exit its underperforming U.S. shale oil and gas business. In rates, European government bond yields followed Treasuries higher. The yield on 10-year Treasuries gained two basis points to 2.20 percent. Germany’s 10-year yield climbed less than one basis point to 0.40 percent. Britain’s 10-year yield increased one basis point to 1.076 percent. Crude advanced before U.S. government data forecast to show stockpiles fell. West Texas Intermediate crude climbed 0.3 percent to $47.38 a barrel. Gold fell 0.5 percent to $1,285.18 an ounce, the largest fall in a week. Economic data include FHFA House Price Index and Richmond Fed Manufacturing Index. Salesforce, Intuit, Coty and Toll Brothers are among companies reporting earnings. Soft German ZEW data sees EUR trend lower. Improving risk tone has led EU Bourses higher. highlighted US plans to continue sending troops to Afghanistan to fight the terror threat emanating from the country. The Nikkei 225 fell -0.05% while the ASX 200 was up 0.42% after numerous earnings, including from BHP Billiton. 10Y JGBs were lower despite a strong 20Y JGB auction as participants move into the long-end following the well-received issuance, leading to curve flattening. The line was sold with the lowest tail of 2017 and highest cover since January 2014.
return of risk-sentiment to the market with today’s sovereign bond-slate once again void of supply. Bunds have somewhat ran out of steam after yesterday failing to target the Aug 11 high with fixed income markets not showing much reaction amid the soft ZEW data release this morning, now awaiting the GE 10yr supply tomorrow. Additionally, some are attributing the pressure on peripheral markets to ongoing speculation about a potential parallel currency in Italy but details are yet to emerge on this front. In currencies, overnight the Asian trading session saw a somewhat risk on tone, which saw JPY and CHF ease off against the greenback with the JPY also consolidating above 109. Of note, large expiries in USD/JPY are set to roll off at the NY cut with lbln at 108.50 and 798MM at 109.00. The EURUSD move above 1.18 had been brief after the currency ran into resistance at 1.1825. Again, it has been a relatively quiet morning with participants eagerly awaiting President Draghi’s speech in Frankfurt. Although EUR has extended on losses following the release of soft ZEW data from Germany, with the currency approaching 1.1750. In commodities, WTI and Brent crude futures trade higher, paring back some of yesterday’s losses which were in part triggered by the resumption of operations at the Deere Park refinery OPEC/Non-OPEC JTC reportedly sees July production deal compliance at 94%. (Newswires) However, this appears to be very much at odds with recent numbers produced by IEA, stating a compliance level of just 74% Kuwaiti oil minister said that OPEC will discuss ending or extending cuts at its November meeting. He also noted that OPEC is still working to push oil stocks below 5-year average. Elsewhere, the risk-appetite has taken the shine modestly off gold prices while Chinese iron ore futures were seen higher by over 5% during Asia-Pac hours. Well I hope some of you in the US saw the solar eclipse yesterday. Here in the UK we had our own solar eclipse and instead of it only lasting 3 minutes it lasted the whole day. It was a total eclipse by thick, gloomy and generally foreboding cloud! One would have to say that clouds continues to hover over financial markets at the moment without necessarily unleashing heavy precipitation. There was a lot of chatter in the market yesterday about what Jackson Hole will bring. On balance I would say investors are much more set up for a non-event than they were 1 or 2 months ago. The general feel is that recent events (softer inflation and softer sentiment in markets) will ensure that both the Fed and the ECB will tread carefully. That likely implies that a non-event (or dovish comments) will have limited impact on the market whereas evidence of tighter policy relative to expectations from either could lead to a bigger reaction. As we said yesterday don’t forget Mr Draghi’s speech at the Lindau symposium in Germany tomorrow. If he is going to say something market moving this week it might be there rather than stateside. Ahead of these events, US equities were mixed but little changed on light volume yesterday. Both the S&P and the Dow edged up 0.1%, while the Nasdaq dipped 0.05%. Within the S&P, the real estate sector was up +1.07%, but gains were largely offset by losses in other sectors including energy and financials. European markets broadly softened, with the Stoxx 600 down -0.40% alongside the Dax (-0.82%) and the FTSE 100 (-0.07%). Elsewhere, the Vix fell 1.1 points to 13.19. This morning in Asia, markets have broadly strengthened. Despite North Korea warning that the US / South Korea will face “merciless revenge” for its annual military drills, the Kospi advanced +0.40%. Elsewhere, Hang Seng was up +1.04% on solid company results and the Nikkei up +0.07% as we type. Back to yesterday and following data last week that showed Germany’s economy grew 2.5% yoy in 2Q, the Bundesbank was relatively upbeat overnight, noting “the strong economic upturn in the German economy is expected to continue in 3Q, with industrial output probably continuing to play an important role, thanks to a substantial expansion in exports…” That said, these comments seem to have little impact on bunds as bonds remain well bid. Yields fell modestly in both US and Europe. Core European bond yields were down 1-2bp across the curve, with bunds (2Y: -1bp; 10Y: -2bps), Gilts (2Y: -1bp; 10Y: -2bps), and French OATs (2Y: -1bp; 10Y: -1bp) all slightly lower in yield while UST 10Y (2Y: -0.5bp; 10Y: -1bps) yields also dipped yesterday but have largely reversed the move in Asia this morning. Turning to currencies, the USD dollar index weakened 0.4% while the Euro/USD had a solid session, up 0.5% yesterday. The Euro is now back above last week’s level and only c0.6% away from the CY17 high of 1.1870. So we’ve cleared levels from last week before the ECB minutes noted that “concerns were expressed about the risk of the (Euro) overshooting in the future”. Elsewhere, Sterling/USD was up 0.2% and the Euro/Sterling was up 0.3%. In commodities, WTI oil fell 2.4% following an OPEC meeting that ended yesterday with no decision on the future of supply cuts. Iron ore continued to increase for the third consecutive day (up c9% in total), following reports of stronger Chinese steel demand. Precious metals were slightly up (Gold +0.6%; Silver +0.3%) and base metals broadly strengthened with Copper (+0.6%). Aluminium (+0.6%) and Zinc (+1.4%). Elsewhere, the UK government has published two more Brexit position papers (a total of five expected this week), reiterating that the country wanted the “freest and most frictionless trade possible” and would seek to preserve existing rules on confidentially. The latest ECB CSPP holdings were released yesterday. They bought a lowly €0.8bn last week which compares to €1.1bn, €1.54bn, €0.79bn, €0.72bn, €1.43bn over the previous five weeks. These continue to be weak summer influenced numbers and this week’s equate to an average of €160mn per day (vs. €351mn/ day since CSPP started). The CSPP/PSPP ratio was 9.6% (previous weeks 11.4%,12.8%, 8.1%, 6%, 10.4%) which is below the average since the April taper begun but the average since this point of 12.7% is still higher than the pre-taper ratio of 11.6%. So the evidence is still in favour of CSPP having been trimmed less than PSPP since April even if there have been some softer weeks of late. As we’ve discussed in recent weeks the ECB probably did a little front loading ahead of the summer to account for summer credit liquidity being worse than in govt. bonds. We’ll have a better idea of where things stand in September. Before we take a look at today’s calendar, we wrap up with the other data releases from yesterday. In the US, the Chicago Fed national activity index for July was lower than expected at -0.01 (vs. 0.10 expected), although the weakness was partly offset by an upward revision to the prior reading. The three-month average stands broadly flat, suggesting an economy growing at around its implied trend. Elsewhere, Canada’s wholesale trade sales for June was in line at -0.5% mom. In the UK the Rightmove house price index (which measures asking prices) fell 0.9% mom in August but remained up 3.1% yoy. As the Ulji Freedom Guardian joint military drills begin near the Korean Peninsula, North Korea’s Kim has threatened “merciless revenge” against the “US Imperialists and South Korean war maniacs” for ignoring his warnings. The US imperialists and the South Korean war maniacs launched the Ulji Freedom Guardian joint military drills aimed at a preemptive attack on the DPRK. Despite the repeated warnings of the DPRK, they have kicked off the war in the pretext of resolving “countering” the “provocation by the north.” This is aimed at igniting a nuclear war on the Korean peninsula at any cost. What is more serious is the fact that on the eve of the war exercises, American troops, including US Pacific Commander and Strategic Commander, flew to the South, contributing far more US troops from overseas, as well as seven vassal states including Australia and Britain. The Korean peninsula has plunged into a critical phase due to the reckless north-targeted war racket of the war maniacs. As Bloomberg notes, KCNA further cites an unidentified military spokesman as saying it would be a misjudgment for the U.S. to think that North Korea will “sit comfortably without doing anything” during the U.S.-South Korea joint military drills. Ongoing drills and visits of U.S. military officials to South Korea create the circumstances for a “mock war” on the Korean peninsula, KCNA says. U.S. can’t avoid “merciless revenge” by North Korea. Additionally, adding further tension, Yonhap reports that three top U.S. military commanders plan to issue a strong warning message to North Korea in a rare joint press availability here later Tuesday, officials said. Pacific Command chief Adm. Harry Harris, Strategic Command head Gen. John Hyten and Missile Defense Agency Director Lt. Gen. Samuel Greaves are scheduled to hold a press conference at a local U.S. Forces Korea (USFK) base. It’s quite unusual for the U.S. commanding generals serving abroad to gather in South Korea and release public statements together. It apparently reflects Washington’s alertness against North Korea’s rapid development of nuclear bombs and missiles. Given the fact that the US Navy has had two ‘accidental collisions’ with slow-moving vessels in recent months, what are the chances this all ends without incident? When we discussed the latest monthly Chinese credit data reported by the PBOC, we pointed out something which to most pundits was broadly seen as success by the Politburo in its deleveraging efforts: for the first time in 9 months, debt within China’s shadow banking system – defined as the sum of Trust Loans, Entrusted Loans and Undiscounted Bank Loans – contracted. These three key components combined, resulted in a 64BN yuan drain in credit from China’s economy, the first negative print since October 2016, and rightfully seen by analysts as evidence that Beijing’s campaign to contain shadow banking and quash risks to the financial system, is starting to bear fruit. Offsetting this unexpected decline in shadow bank credit (if not Total Social Financing) was a greater than expected increase in traditional yuan bank loans. As we observed last Tuesday, both corporate loans and household loans increased greater than last year; new corporate loans advanced to CNY354bn from a decline of CNY3bn a year ago, with long-term corporate loans contributing CNY433bn (a year ago: CNY151bn) and short-term loans adding CNY63bn (a year ago: CNY-201bn). New household loans registered CNY562bn, compared with CNY458bn a year ago. …. thanks to healthy bank loan creation, is good for both China and the rest of the world, and suggests that despite the sharp drop in China’s credit impulse, there is more where it came from. There is just one problem: there very well may not be much left where it came from. In fact, according to analysts, there may be almost nothing left. Reuters reports that following 7 months of blistering credit creation in terms of both new Loans and Total Social Financing, Chinese banks are set to see a slowdown in lending growth in the second half of the year, having exhausted most of their annual credit quota, in the process raising the spectre of corporate defaults as financing costs climb further in the world’s second-largest economy. The math is disturbing: only six months into 2017, banks have already used 80% of their yearly credit quota over January to June, versus the usual 60%, amid the above mentioned regulatory push to bring shadow financing activities to the main loan book, and Beijing’s crackdown on riskier lending. While “loan demand is strong throughout the whole year”, as the second chart from the top shows, “the core conflict in the second half is loan quota – whether banks will be able to extend more loans than they originally planned“ said Ma Kunpeng, chief financial industry analyst at China Merchants Securities, quoted by Reuters. While it remains to be seen if Beijing will allow banks to breach their quotas, a sharp slowdown in new loan issuance is expected in either case: as reported last week, China saw a 12.9% growth in outstanding yuan loans as of the end of June. Nomura China economist Wendy Chen expects this to slow to 12.6% in Q3 and to 12.4% in Q4, more than 1% decline from 13.5% in 2016: a substantial hit to China’s overly credit-reliant economy. Adverse impact on the economy aside, the sharp contraction in bank loans in Q3 and Q4 means that “corporate defaults will rise if the availability of finance is further restricted. This could become a threat to economic growth … especially if defaults are concentrated in labor-intensive segments like steel and coal,” Moody’s said. While China’s commercial banks have been seemingly impervious to China’s credit bubble, reporting higher first-half profits, while overall non-performing loans in Q2 remaining unchanged from Q1 (even if some analysts believe the real number is orders of magnitude higher), analysts cautioned that slower credit growth would eventually take a toll on banks’ profit margins. Just like in the US, net interest margins in China have fallen sharply in the past quarters following six successive benchmark interest rate cuts in 2014 to 2015. For China’s top lender ICBC, the margin is forecast to narrow to 2.13 per cent in 2017 from 2.21 per cent last year, while China Construction Bank could report a drop of 27 basis points to 2.09 per cent in 2017, Thomson Reuters data shows. Compounding the NIM decline and collapsing margins is Chinese banks’ move to increase deposit interest rates this year to as much as 40% above central bank benchmark rates to lure depositors, statistics compiled by Reuters showed. Part of the higher costs has been passed on to corporate borrowers. The price of loans as measured by the weighted average of loan interest rates rebounded to 5.67 per cent in June, from 5.22 per cent in September. But that will not be sufficient to cushion the impact on near-term profits. As a reminder, China’s economic growth has already been showed signs of fading in July when key economic indicators from retail sales, to industrial production to capital spending all declined while lending costs rose, but a hard landing is unlikely with Beijing keen to ensure stability ahead of a once-in-five-years Communist Party leadership reshuffle later this year. What happens after, however, is very much an open question. Meanwhile, if Chinese banks only have 20% of their annual loan issuance quota left for the entire second half of the year, and if Beijing refuses to boost these quotas, the next global economic shock may be just several months ahead. In a move that is certain to infuriate China further and result in another deterioration in diplomatic relations between Washington and Beijing, moments ago the United States slapped both Chinese and Russian entities and individuals with new sanctions in the Trump administration’s escalating attempts to pressure North Korea to relent and stop its nuclear program and occasional missile launches. The U.S. Department of the Treasury’s Office of Foreign Assets Control (OFAC) designated 10 entities and six individuals in response to North Korea’s ongoing development of weapons of mass destruction (WMD), violations of United Nations (UN) Security Council Resolutions, and attempted evasion of U.S. sanctions. Today’s sanctions target third-country companies and individuals that (1) assist already-designated persons who support North Korea’s nuclear and ballistic missile programs, (2) deal in the North Korean energy trade, (3) facilitate its exportation of workers, and (4) enable sanctioned North Korean entities to access the U.S. and international financial systems. “Treasury will continue to increase pressure on North Korea by targeting those who support the advancement of nuclear and ballistic missile programs, and isolating them from the American financial system,” said Treasury Secretary Steven T. Mnuchin. OFAC designated China-based Dandong Rich Earth Trading Co., Ltd. for its support to UN- and U.S.-designated Korea Kumsan Trading Corporation, an entity OFAC previously designated for being owned or controlled by, or acting or purporting to act for or on behalf of, directly or indirectly, the UN- and U.S.-designated General Bureau of Atomic Energy, which is responsible for North Korea’s nuclear program. Dandong Rich Earth Trading Co., Ltd. has purchased vanadium ore from Korea Kumsan Trading Corporation. UNSCR 2270 prohibits North Korea’s exports of vanadium ore, and requires member states like China to prohibit the procurement of vanadium ore from North Korea. OFAC designated Gefest-M LLC and its director, Russian national Ruben Kirakosyan, for support to the UN- and U.S.-designated Korea Tangun Trading Corporation, also known as Korea Kuryonggang Trading Corporation, which is subordinate to the UN- and U.S.-designated Second Academy of Natural Sciences, an entity involved in North Korea’s WMD and missile programs. Gefest-M LLC, a company based in Moscow, has been involved in the procurement of metals for Korea Tangun Trading Corporation’s Moscow office. OFAC also designated China- and Hong Kong-based Mingzheng International Trading Limited (“Mingzheng”). Mingzheng acts as a front company for UN- and U.S.-designated Foreign Trade Bank (FTB), and it has provided financial services to FTB by, among other things, conducting U.S.-dollar denominated transactions on behalf of FTB. FTB is North Korea’s primary foreign exchange bank; it was designated by the United Nations on August 5, 2017 as part of UNSCR 2371. OFAC designated FTB in 2013 for facilitating transactions on behalf of North Korea’s proliferation network, including for UN- and U.S.-designated Korea Mining Development Corporation and Korea Kwangson Banking Corporation. On June 29, 2017, OFAC designated Mingzheng’s owner, Sun Wei. The Treasury also designated three Chinese coal companies collectively responsible for importing nearly half a billion dollars’ worth of North Korean coal between 2013 and 2016. Dandong Zhicheng Metallic Materials Co., Ltd. (“Zhicheng”), JinHou International Holding Co., Ltd., and Dandong Tianfu Trade Co., Ltd. have sold, supplied, transferred, or purchased coal or metal, directly or indirectly, from North Korea, and the revenue may have benefitted the nuclear or ballistic missile programs of the Government of North Korea or the Workers’ Party of Korea. JinHou International Holding Co., Ltd. and Dandong Tianfu Trade Co., Ltd. also were designated for operating in the mining industry in the North Korean economy. Meanwhile, top U.S. officials have said they do not want to take military action against North Korea unless it is a last resort, and as a result getting China to cooperate is seen as a key part of a diplomatic solution. Of course, what this latest round of sanctions will achieve, is to further anger Beijing and the local population, in the process making a diplomatic solution even more unlikely and “forcing” America’s ruling Generals, Kelly and McMaster to launch the first “preemptive” shot against Pyongyang. That did not take China long to respond to the latest sanctions: China states that they should immediately correct its mistake or suffer retaliation: diplomacy re North Korea is now out of the realm of possibilities. Less than 4 hours ago, the US Treasury announced that in the the latest set of actions targeting North Korea’s “WMD program”, among the entities sanctioned would be several Chinese and Russian companies and individuals. We said that “what this latest round of sanctions will achieve, is to further anger Beijing and the local population.” Well, we didn’t even have to wait all day for China to respond on the next morning as it traditionally does, and according to Reuters citing an embassy spokesman, Beijing was so furious with the US “provocation” it scrapped its own protocol of waiting during a “cooldown” period, and instead ripped right back, “urging” the U.S. to “immediately correct its mistake”‘ of sanctioning Chinese firms over North Korea, to avoid impact on bilateral cooperation. Since the US will not “correct its mistake”, either “immediately” or at any time, China will have no choice but to escalate, in the process making any credible diplomacy involving North Korea impossible, forcing” America’s hand when it comes to North Korea, now that the diplomatic option is out of the picture. And virtually assuring that there is no hope for a diplomatic resolution of the North Korean crisis, earlier today a North Korean envoy to a UN disarmament forum refused to negotiate its nuclear program, accusing the US and South Korea of using joint military drills to carry out “an aggressive war scenario” and “a secret operation” against the North’s leadership. “The DPRK will never place its self-defense nuclear deterrence on the negotiating table or step back from the path it took to bolster the national nuclear force,” a North Korean diplomat stated at the UN disarmament forum in Geneva, as cited by Reuters. A North Korean envoy to a UN disarmament forum has refused to negotiate its nuclear program, accusing the US and South Korea of using joint military drills to carry out “an aggressive war scenario” and “a secret operation” against the North’s leadership. As a result, shares of the Bradford, UK-based company dropped more than 73% to 521 pence in London morning trade. The stock is down 82% this year, wiping more than 3 billion pounds from its market value. In what may be the beginning (of the end) of yet another subprime bubble bursting (we have lost count which one this is), in its second profit warning in two months, the subrime lender said it now expects a “pre-exceptional loss” for the home credit business of between 80 million pounds ($103 million) and 120 million pounds, after previously predicting a 60 million-pound profit. The company also cited further deterioration at its home credit business after a botched roll-out of new technology this year, when it scrapped a more-than-century-old model of self-employed door-to-door agents. Crook, who was CEO for a decade, said in June that many of its 4,500 salesmen and debt collectors quit or stopped working as hard when they were informed they would be replaced by a smaller number of iPad-toting full-time staff, according to Bloomberg. Meanwhile, the company said the U.K. Financial Conduct Authority is investigating the Vanquis Bank credit-card unit, and the regulator had previously ordered Provident to stop offering a particular repayment product, the company said Tuesday. Provident scrapped its interim dividend and said a full-year payout is also unlikely. Manjit Wolstenholme will temporarily run the firm as executive chairman. Provident said Tuesday that the FCA ordered the company to stop offering “repayment option plans” in April 2016. The products had been contributing about 70 million pounds in revenue a year. As Bloomberg reports, While Provident didn’t make any mention of the broader U.K. economic environment or Brexit, its profit warning comes as the Bank of England cautions that the nation’s consumer credit market is overheating after years of low interest rates and low defaults bred complacency. Crook had previously said Provident’s business model was more resilient to an economic downturn than the big banks; he was wrong. Meanwhile, as revenue from its old sales force continues to decline, its new technology isn’t panning out either. Debt collection performance has fallen to 57 percent this year from 90 percent at the end of 2016, according to the statement. Likewise, weekly sales were running at about 9 million pounds lower in the same period. Provident: its stock had tripled over a decade that saw other British banks collapse or get bailed out in the financial crisis; of course, it has given up most of it back now that the time has come to collect that money. Lebanese Army Finds ISIS Anti-Aircraft Missile Cache: Could Passenger Jets Be Hit? Does ISIS have the capability of taking out a civilian passenger jet?According to an alarming new report by Reuters the answer appears to be yes. The Islamic State has long been rumored as in possession of surface-to-air missiles, and now it appears a US ally is providing ground level confirmation of what might be a worst case nightmare scenario come true. The Lebanese Army has recently been engaged in a fierce campaign to root out ISIS terrorists from the Arsal border pocket – a northeast region of Lebanon bordering Syria which has seen fighting rage since 2014. As we previously reported, the operation is receiving some level of assistance from US special forces advisers as well as coordination from Hezbollah, while at the same time the Syrian Army is attacking from the Syrian side of the border in the Qalaman mountains. Lebanon’s army found anti-aircraft missiles among with a cache of weapons in an area abandoned by Islamic State militants, it said on Monday. The arms cache also included mortars, medium and heavy machine guns, assault rifles, grenades, anti-tank weapons, anti-personnel mines, improvised explosive devices and ammunition. A Hezbollah offensive last month forced militants from the Nusra Front group, formerly al Qaeda’s official Syrian branch, to quit an adjacent enclave on the border for a rebel-held part of Syria. On Friday, the Lebanese army said it had discovered surface-to-air missiles in a weapons cache left by the Nusra militants in an area captured by Hezbollah and then taken over by the army. Such anti-aircraft missiles, commonly called MANPADS (“man-portable air-defense system”: heat seeking shoulder fired missiles capable of hitting targets flying at anywhere between 10,000 and 15,000 feet), have appeared on the Syrian battlefield in recent years in the hands armed opposition groups supported by the West and Gulf states, including various FSA and Islamist factions like Ansar al-Islam Front (operating in the south) and Ahrar al-Sham (operating in the north of Syria). These groups have at various times filmed and demonstrated themselves to be in possession of externally supplied MANPADS, which are believed by analysts to have entered Syria in multiple waves via different routes and external sponsors, including old Soviet models shipped out of Libya, Chinese FN-6’s provided by Qatar, and through NATO member Turkey’s porous border with Syria. Some supplies were also likely gained through opposition takeovers of Syrian government storehouses as well as ISIS seizures of Iraqi government bases and equipment. Since the reveal of Fn-6 anti-aircraft missile in the hands of the Free Syrian Army, speculations and warnings emerged on the danger of empowering non-state forces with such advanced mobile weapons. While many saw that empowering the FSA with weapons like these is of no perilous consequences, others had ample doubts and worries. The theory behind the proliferation of those Chinese manufactured weapons is that Qatar purchased them from the Sudan military stockpiles and transferred them with the cooperation of Turkey into Syria, and specifically into Deir Ezzor, Aleppo, Idlib, and Lattakia in addition to Homs’s northern countryside and Qalamoun. Meanwhile, hawks in Congress have at various times over the course of the 6-year long war argued for openly supplying so-called “moderate” opposition factions in Syria with US made Stinger missiles. Though it’s unknown for sure whether US sourced Stingers ever made it to Syria as part of the CIA’s covert program, sporadic reports of Stingers in the hands of anti-Assad fighters have surfaced over the years. March 12, 1975: A Douglas C-54D-5-DC passenger airliner, operated by Air Vietnam, crashed into Vietnamese territory after being hit by a MANPADS. All six crew members and 20 passengers were killed in the crash. September 3, 1978: An Air Rhodesia Vickers 782D Viscount passenger airliner crash landed after being hit by a MANPADS fired by forces from the Zimbabwe Peoples Revolution Army. Four crew members and 34 of the 56 passengers were killed in the crash. December 19, 1988: Two Douglas DC-7 spray aircraft en route from Senegal to Morocco, chartered by the U.S. Agency for International Development to eradicate locusts, were struck by MANPADS fired by POLISARIO militants in the Western Sahara. One DC-7 crashed killing all 5 crew members. The other DC-7 landed safely in Morocco. September 22, 1993: A Tupolev 154B aircraft operated by Transair Georgia was shot down by Abkhazian separatist forces, crashed onto the runway and caught fire, killing 108. April 6, 1994: A Dassault Mystère-Falcon 50 executive jet carrying the Presidents of Rwanda and Burundi and its French flight crew was shot down over Kigali, killing all aboard and sparking massive ethnic violence and regional conflict. October 10, 1998: A Boeing 727-30 Lignes Aeriennes Congolaises airliner was downed over the Democratic Republic of the Congo jungle by Tutsi militia, killing 41. December 26, 1998: A United Nations-chartered Lockheed C-130 Hercules transport was shot down over Angola by UNITA forces, killing 14. January 2, 1999: A United Nations Lockheed L-100-30 Hercules transport was shot down by UNITA forces in Angola, killing 9. November 28, 2002: Terrorists fired two MANPADS at an Arkia Airlines Boeing 757-3E7 with 271 passengers and crew as it took off from Mombasa, Kenya. Both missiles missed. November 22, 2003: A DHL Airbus A300B4-203F cargo jet transporting mail in Iraq was struck and damaged by a MANPADS. Though hit in the left fuel tank, the plane was able to return to the Baghdad airport and land safely. March 23, 2007: A Transaviaexport Ilyushin 76TD cargo plane was shot down over Mogadishu, Somalia, killing the entire crew of 11. With the Lebanese Army’s alarming announcement that it has recovered MANPADS previously in the possession of ISIS, and with such dangerous weapons systems remaining ubiquitous in rebel-held parts of Syria, we hesitate to ponder the nightmarish scenario:is it only a matter of time before ISIS downs a civilian passenger jet? International weapons inspectors should be allowed access to the recovered ISIS stockpile and weapons should be traced to their sources and countries of origin. As has been effectively demonstrated a number of times before, it is very possible to obtain definitive answersconcerning how these missiles made it into the hands of ISIS in the first place. Is The Second Shale Boom Grinding To A Halt? The “peak shale” narrative got a boost in late July when one of the world’s most bearish hedge funds, Horseman Global, announced it was aggressively shorting shale companies on the thesis that funding is about to “run dry”, resulting in a sharp drop in production and with the lack of capex, would lead to another round of industry defaults (while sending the price of oil higher). Fast forward to today when overnight, we got the clearest indication yet that the US shale sector may have indeed have peaked, when BHP Billiton – the world’s largest miner – said it was in talks with potential buyers of its U.S. shale assets, purchased during a frenzied $20 billion buying spree in 2011, just as the price of oil peaked. “We’re talking to many parties and we’re hopeful” of completing a small number of trade sales to divest the onshore oil and gas division, Chief Executive Officer Andrew Mackenzie told Bloomberg Television Tuesday in an interview, adding that the moves on shale and potash aren’t the result of shareholder pressure. “We have been moving in this direction for some time” on shale. As Bloomberg adds, BHP’s strategic pull-back by comes after new Chairman Ken MacKenzie, who starts his job next month, met more than a hundred investors in recent weeks in Australia, the U.S. and the U.K. in the wake of the campaign by some shareholders calling for reform. BHP’s admission that there is no more upside for its shale assets, in their current form, is a victory for Elliott Singer’s ongoing activist campaign, which has been pushing for a disposition of these assets in a vocal activist campaign. According to Singer’s Elliott Management, strategic missteps by BHP’s leadership, including in the shale unit, have destroyed $40 billion in value; Elliott launched its public campaign seeking a range of reforms in April. Admitting that Elliott is right, during a call with analysts, CEO Mackenzie said BHP’s 2011 shale deals had been too costly, poorly timed and the eighth-largest producer in U.S. shale didn’t deliver the expected returns. That said, if the company expected oil prices to rebound, or if the shale assets to become sufficient productive where they would generate positive returns, he would hardly have sold them. Which is why in the current configuration of prices and technology, at least one major player in the space has confirmed that shale’s euphoric days may be over. Discussions among BHP shareholders have been dominated by concerns over shale and potash, according to Craig Evans, a portfolio manager at Tribeca Investments Partners Pty, which holds the producer’s shares. Tribeca and other investors have also pressed the case with BHP directly, he said. 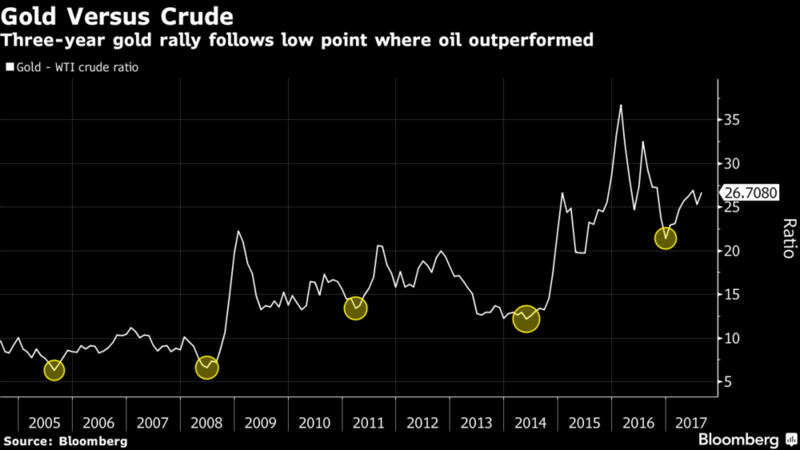 Some believe that BHP timed its asset sale at just the right time: “BHP are going to get better value than they would have two years ago after the surge in crude oil price from last year’s 12-year low,” David Lennox, an analyst at Fat Prophets, said on Bloomberg TV. The company has “probably picked an opportune time because we’ve seen the oil price come up from a bottom,” he said. Of course, a much bigger question is whether the potential buyer will agree, as any acquiror will be purchasing not on current or historical prices, but where they expect oil prices to go in the future. As such, the big wildcard is shale’s access to cheap funding, which for the past 3 years has been the only factor that mattered not only for the US oil industry, but also for OPEC, whose repeated attempts to push the price of oil higher has been foiled every single time thanks to record low junk debt yields and an investor base that will oversubscribe every single shale offering. Well, as we showed last month, that is now ending as bond investors have suddenly turned quite skittish, and the result is that US shale production has not only peaked but is once again declining. While it remains to be seen how the overall industry will respond, if indeed we have hit “peak shale”, OPEC’s long awaited moment of redemption may finally be here. Amid Libya headlines and contract rollover, WTI prices were wild heading into the inventory data tonight. Following two weeks of surprising builds in Gasoline inventories, API reports a surprise 3rd weekly build in gasoline inventories, and crude drawing only modestly (in line with expectations). The initial reaction was a kneejerk lower, breaking down the day’s wedge. Early TUESDAY morning USA 10 year bond yield: 2.2061% !!! UP 1 IN POINTS from MONDAY night in basis points and it is trading JUST BELOW resistance at 2.27-2.32%. The 30 yr bond yield 2.7808, UP 1 IN BASIS POINTS from MONDAY night. USA dollar index early TUESDAY morning: 93.51 UP 42 CENT(S) from MONDAY’s close. the Italian 10 yr bond yield is trading 53 points HIGHER than Spain. Meanwhile, debt ceiling concerns remain high in the T-Bill market…. We will not talk about numbers of troops or our plans for further military activities. Conditions on the ground, not arbitrary timetables, will guide our strategy from now on. America’s enemies must never know our plans or believe they can wait us out. I will not say when we are going to attack, but attack we will. Another fundamental pillar of our new strategy is the integration of all instruments of American power, diplomatic, economic, and military, toward a successful outcome. Someday, after an effective military effort, perhaps it will be possible to have a political settlement that includes elements of the Taliban and Afghanistan, but nobody knows if or when that will ever happen. America will continue its support for the Afghan government and the Afghan military as they confront the Taliban in the field. Our troops will fight to win. We will fight to win. From now on, victory will have a clear definition — attacking our enemies, obliterating ISIS, crushing al Qaeda, preventing the Taliban from taking over Afghanistan, and stopping mass terror attacks against America before they emerge. We will ask our NATO allies and global partners to support our new strategy, with additional troop and funding increases in line with our own. We are confident they will. Ultimately, it is up to the people of Afghanistan to take ownership of their future, to govern their society, and to achieve an everlasting peace. We are a partner and a friend, but we will not dictate to the Afghan people how to live or how to govern their own complex society. We are not nation building again. We are killing terrorists. The next pillar of our new strategy is to change the approach in how to deal with Pakistan. We can no longer be silent about Pakistan’s safe havens for terrorist organizations, the Taliban, and other groups that pose a threat to the region and beyond. Pakistan has much to gain from partnering with our effort in Afghanistan. It has much to lose by continuing to harbor criminals and terrorists. In the past, Pakistan has been a valued partner. Our militaries have worked together against common enemies. The Pakistani people have suffered greatly from terrorism and extremism. We recognize those contributions and those sacrifices, but Pakistan has also sheltered the same organizations that try every single day to kill our people. We have been paying Pakistan billions and billions of dollars, at the same time they are housing the same terrorists that we are fighting. But that will have to change. And that will change immediately. Another critical part of the South Asia strategy or America is to further develop its strategic partnership with India, the world’s largest democracy and a key security and economic harbor of the United States. We appreciate India’s important contributions to stability in Afghanistan, but India makes billions of dollars in trade with the United States, and we want them to help us more with Afghanistan, especially in the area of economic assistance and development. We are committed to pursuing our shared objectives for peace and security in South Asia and the broader Indo-Pacific region. Oddly enough, zero mentions of China, almost as if Trump is telegraphing the new US “axis” in South Asia. In conclusion, Trump may not be able to get approval from Congress to pass his domestic spending agenda, but at least he is about to spend “billions” to continue a war that started 16 years ago and will surely never end, and make shareholders of defense stocks even richer. Roughly around the time Trump started his Afghanistan speech, Ron Paul tweeted out a cautiously optimistic note: “Hoping for the best in tonight’s @realDonaldTrump speech but fearful that foreign intervention is only going to get worse. #Afghanistan.” Alas it was not meant to be, and over 20 tweets later in what proved to be the angriest tweetstorm of the night, Ron Paul had come to a conclusion: Trump is now nothing more than the latest neocon, one whom even Lindsey Graham applauded. Steve Bannon brakes removed. Neocons feeling their oats. The military personnel are the victims of bad foreign policy. Sad that these wars the politicians argue for are unconstitutional yet we are told we are over there defending the Constitution. Mr. President it’s too bad you do not follow your instincts. Planned in Afghanistan? What about Saudi Arabia?? What’s wrong with rapid exit? We just marched in we can just march out. So far very discouraging. Sounds like pure neocon foreign policy. Remember: there was no al-Qaeda until our foolish invasion of Iraq based on neocon lies. The American people deserve to know when we are going to war and MUST give you permission through their representatives in Congress! Emphasis on Pakistan just means the war going to be expanded! Emphasis on military alliance with India may well lead to more vicious war between nuclear states Pakistan and India. Smart? Terrorism is one thing, but what about massive collateral damage? Killing civilians creates more terrorism. Round and round we go. Nothing new. More of the same. Obama was wrong. This is NOT the good war. Sooner we get out the better. More killing is not the road to peace. The emphasis on the “grave danger” of terrorism is greatly exaggerated. But more intervention surely creates more terrorism. How many Americans are really sitting around worrying about an Afghan terrorist coming over and killing them? So many of our problems are self-inflicted by a deeply flawed foreign policy. US troops – and the family members – suffer the consequences. Big issue of the night: US expanding the war into Pakistan. Could precipitate more conflict between nuclear India and Pakistan. If Americans are tired of 16 year war, how will they feel about another decade or two? When will they wake up? Our ultimately “hasty” departure from Vietnam finally ended a lot of grief. Even if it came way too late. Beware! @LindseyGrahamSC loves Trump’s speech! Why are arch-neocons celebrating so much? Very telling! There’s nothing hasty about ending America’s longest war. @POTUS bowed to military-industrial establishment; doubled down on perpetual war. Based on Trump’s speech, Ron Paul’s concerns are well founded. Then again, as we await Breitbart’s response to Trump’s adress one thing is certain: Steve Bannon will not be happy with what “neocon” Trump said tonight, even if the WaPo and NYT are now on “mute” mode when it comes to NSA-sourced, anti-Trump scoops. And while there is a distinct possibility that tomorrow night, when addressing his increasingly shaky core support base, Trump will change his mind, with two generals whispering in his ear constantly to determine US foreign policy even as two ex-Goldmanites now write domestic US policy, it is quite likely that the Trump who was unveiled tonight, is the Trump that will stay with the US population for the indefinite future. And if for some reason the “new and improved” Trump slips and fades away again… well there’s always the Mueller “Russia collusion” probe in the background keeping the president on his toes. Update: Here’s Breitbart’s take, as expected. When we reported last week that Imran Awan and his wife had been indicted by a grand jury on 4 counts, including bank fraud and making false statements related to some home equity loans, we also noted that those charges could simply be placeholders for further developments yet to come. Now, according to a new report from the Daily Caller, the more interesting component of the FBI’s investigation could be tied to precisely why New York Democrat Representative Yvette Clarke quietly agreed in early 2016 to simply write-off $120,000 in missing electronics tied to the Awans. A chief of staff for Democratic Rep. Yvette Clarke quietly agreed in early 2016 to sign away a $120,000 missing electronics problem on behalf of two former IT aides now suspected of stealing equipment from Congress, The Daily Caller News Foundation has learned. Clarke’s chief of staff at the time effectively dismissed the loss and prevented it from coming up in future audits by signing a form removing the missing equipment from a House-wide tracking system after one of the Awan brothers alerted the office the equipment was gone. The Pakistani-born brothers are now at the center of an FBI investigation over their IT work with dozens of Congressional offices. The $120,000 figure amounts to about a tenth of the office’s annual budget, or enough to hire four legislative assistants to handle the concerns of constituents in her New York district. Yet when one of the brothers alerted the office to the massive loss, the chief of staff signed a form that quietly reconciled the missing equipment in the office budget, the official told TheDCNF. Abid Awan remained employed by the office for months after the loss of the equipment was flagged. If true, of course this new information would seem to support previously reported rumors that the Awans orchestrated a long-running fraud scheme in which their office would purchase equipment in a way that avoided tracking by central House-wide administrators and then sell that equipment for a personal gain while simultaneously defrauding taxpayers of $1,000’s of dollars. Meanwhile, according to the Daily Caller, CDW Government could have been in on the scheme. They’re suspected of working with an employee of CDW Government Inc. — one of the Hill’s largest technology providers — to alter invoices in order to avoid tracking. The result would be that no one outside the office would notice if the equipment disappeared, and investigators think the goal of the scheme was to remove and sell the equipment outside of Congress. According to the official who talked to TheDCNF, Clarke’s chief of staff did not alert authorities to the huge sum of missing money when it was brought to the attention of the office around February of 2016. A request to sign away that much lost equipment would have been “way outside any realm of normalcy,” the official said, but the office did not bring it to the attention of authorities until months later when House administrators told the office they were reviewing finances connected to the Awans. The administrators informed the office that September they were independently looking into discrepancies surrounding the Awans, including a review of finances connected to the brothers in all the congressional offices that employed them. The House administrators asked Clarke’s then-chief of staff, Wendy Anderson, whether she had noticed any anomalies, and at that time she alerted them to the $120,000 write-off, the official told TheDCNF. Of course, the missing $120,000 covers only Clarke’s office. As we’ve noted before, Imran and his relatives worked for more than 40 current House members when they were banned from the House network in February, and have together worked for dozens more in past years so who know just how deep this particular rabbit hole goes. Also makes you wonder what else Debbie Wasserman-Schultz and the Awans might be hiding. Certainly the decision by Wasserman-Shultz to keep Awan on her taxpayer funded payroll, right up until he was arrested by the FBI while trying to flee the country, is looking increasingly fishy with each passing day. This is going to be very interesting: a Federal Judge orders the IRS to release names of specific IRS employees who were told to target various Tea Party Conservative groups. The actions of the IRS in targeting Tea Party members are criminal in nature. The judge ordered the iRS that they have to reasons for the targets…. Well, as a testament to the efficiency of our legal system, it turns out that the case is still ongoing some 5 years later. Of course, this has to be a simple bureaucracy issue because there is no way that the Obama administration, you know, the only scandal-free White House in modern history, played any role in delaying the completely transparent transmission of information about this shocking threat to our Democracy…just ask CNN…we’re sure they’ll confirm the same. Judge Reggie B. Walton of the U.S. District Court for the District of Columbia also said the IRS must provide information about which groups were targeted and why,along with a strategy to make sure such targeting doesn’t happen again. Of course, as Judicial Watch’s Chris Farrell notes, this single court decision managed to accomplish more in getting to the bottom of the IRS scandal than the Obama administration and Congress did in multiple years. “This was creepy, chilling stuff,” Farrell told Fox News. That said, we’re certain that if we failed to pay taxes for 6 years that the IRS would be equally understanding.